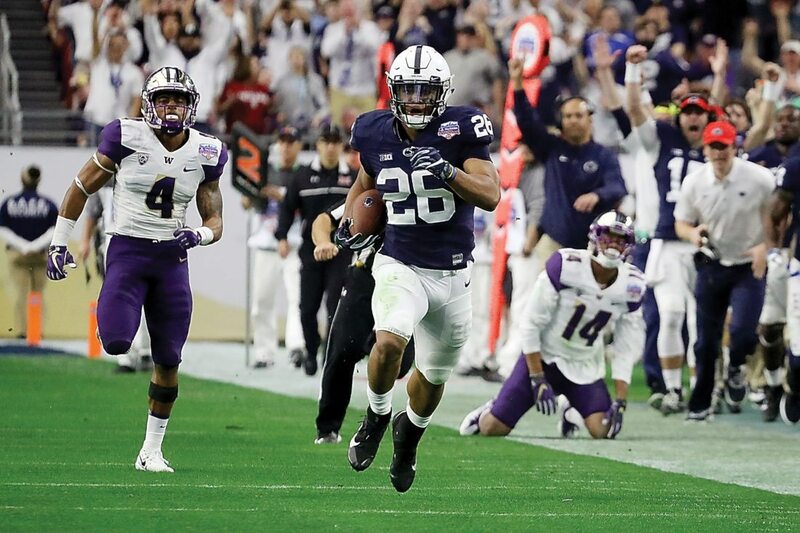 Photo for the Mirror by Christopher Shannon Penn State running back Saquon Barkley runs away from everyone on a 92-yard touchdown run as coach James Franklin celebrates on the sideline. GLENDALE, Ariz. — Trace McSorley gave a little smirk when told of his incredible day throwing the football on third down. “Yeah, that’s pretty good,” he said. No, not just pretty good. You can watch a season’s worth of college or pro football and never see a quarterback pull off what McSorley did Saturday. Penn State played well in a lot of areas, but the biggest reason why it beat Washington in the Fiesta Bowl, 35-28, was because McSorley refused to let the offense leave the field. The junior quarterback was 12-for-12 for 193 yards, two TDs and 10 first downs while throwing on third down. He led the Nittany Lions’ offense to an explosive day against a very good Washington defense before 61,842 fans at University of Phoenix Stadium. What makes McSorley so special? “Just how competitive he is, how smart he is, how nothing fazes him,” Rahne said. 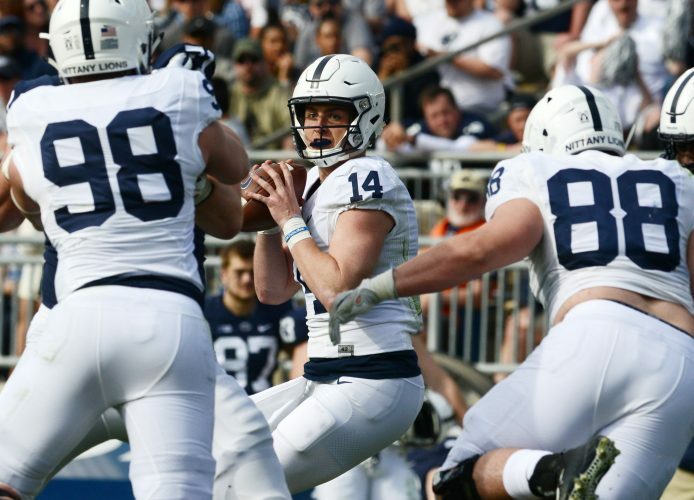 McSorley completed 32-of-41 passes for 341 yards, the second-most passing yards for PSU in a bowl game (Christian Hackenberg had 371 in the 2014 Pinstripe Bowl). McSorley added the two touchdowns but also threw two interceptions. Saquon Barkley, in what was likely his final college game, tied a PSU record with a 92-yard run on a second-quarter touchdown and finished with 137 yards and two scores on 18 carries. Penn State raced out to a 28-7 lead early in the second quarter, was up 28-14 at the half and held on late as Washington had the ball in the closing seconds with a chance to tie. The No. 9 Lions finished the season 11-2 and improved to 7-0 all-time in the Fiesta Bowl. Washington came in ranked No. 12 and finished 10-3. Overall, Penn State converted 13-of-17 third-down chances, frustrating the Huskies’ defense time and again because it simply could not get off the field. Penn State rushed for 203 yards against the nation’s No. 1 run defense. The Lions scored 35 points against a defense ranked sixth in scoring average. PSU also piled up 545 total yards, dominating Washington’s defense pretty much from start to finish. For good measure, McSorley also was 1-for-1 throwing on fourth down. As McSorley mentioned, the PSU offensive line came up big against a stout defense. The line allowed only one sack for a loss of 1 yard and gave McSorley time to throw on the vast majority of his dropbacks. On the other rare occasions, the elusive quarterback used his great scrambling ability to buy himself more time. McSorley hit DaeSean Hamilton for a 48-yard TD on the game’s opening series, which was the first time all season Washington allowed a play of more than 40 yards. McSorley threw an interception in the end zone on the second series, but he came back out firing on the third and led another TD drive that was finished off by a 2-yard Barkley run. Washington made a lot of mistakes early on in finding itself down 14-0. The Huskies used a gadget play as a receiver threw a deep pass to a tight end that helped them score a touchdown and pull within 14-7. Penn State answered with a 76-yard drive and Miles Sanders 1-yard TD, then Barkley busted free for his 92-yard score to make it 28-7 with 9:01 left in the first half. Washington scored late in the half and then pulled within 28-21 with an 80-yard TD drive to open the second half. But once again, Penn State answered that scoring drive with one of its own, as McSorley found Hamilton for a 24-yard touchdown to make it 35-21. Washington desperately needed a big play and got one as Myles Gaskin busted up the middle for a 69-yard TD run with 6:52 to play. Things then got interesting in the final few minutes as the Lions tried to finish things off. Penn State faced fourth-and-inches at the Huskies’ 23 inside of a minute and was going to go for it, but offensive lineman Brendan Mahon was flagged for a false start. On fourth-and-6 from the 28, Franklin tried to seal the game with a field goal from Tyler Davis, but his kick from 45 yards was wide right. Washington took over at its own 28 with 34 seconds to go and a chance to tie. Jake Browning misfired on three passes to set up fourth down, and the Huskies pulled off a hook-and-lateral play that got them a first down. However, instead of running out of bounds to give his team a chance at a last-second Hail Mary, receiver Dante Pettis lateraled the ball backwards, and it was caught by PSU linebacker Brandon Smith to seal the win.